Regulary acclaimed Tobago's Leading Hotel in the annual World Travel Awards, the Blue Haven Hotel is Tobago's premier boutique hotel and boasts 55 luxurious rooms beside stunning Bacolet Beach. Our Superior rooms are fully airconditioned and offer comfortable and luxurious holiday accommodation. 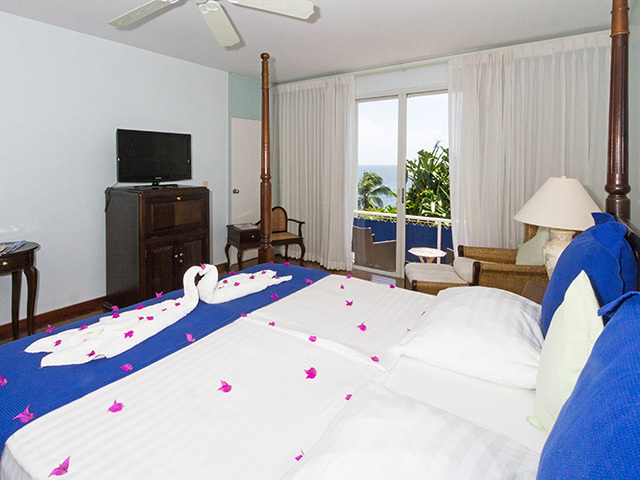 Our Deluxe rooms are a little more spacious, with all the other advantages of the Superior rooms. 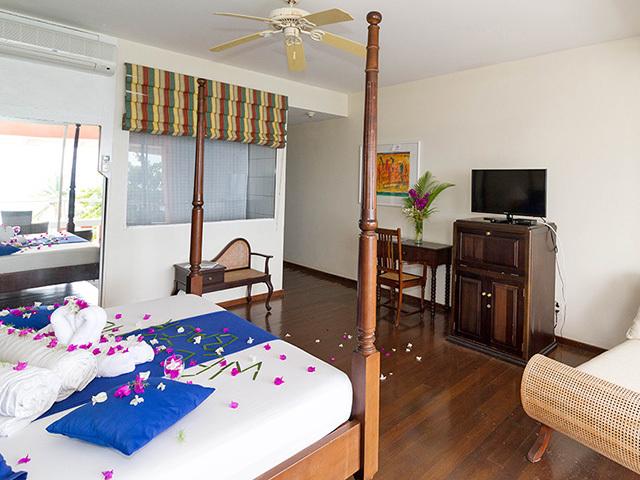 The Junior Suites are our largest rooms and feature a fully furnished additional lounge area. Our beautiful hotel is surrounded by the sea on three sides and immediately beside stunning Bacolet Beach, where the Robinson Crusoe film was shot and where you will be able to enjoy our 'No Problem' beach bar. Located on the outskirts of our vibrant capital, Scarborough, our central location is ideal for excursions around beautiful Tobago. We are little more than a 20-minute drive from the airport and just 5 minutes from the port. There couldn't be a more romantic spot for your wedding ceremony or honeymoon than the Blue Haven hotel. We can offer a range of wedding packages to suit every taste and will handle all the wedding formalities. The Blue Haven Hotel are regular winner of industry awards, including 'Tobago's Leading Hotel' in the annual World Travel Awards and 'Tobago's Leading Boutique Hotel' from Caribbean Travel & Living Awards. 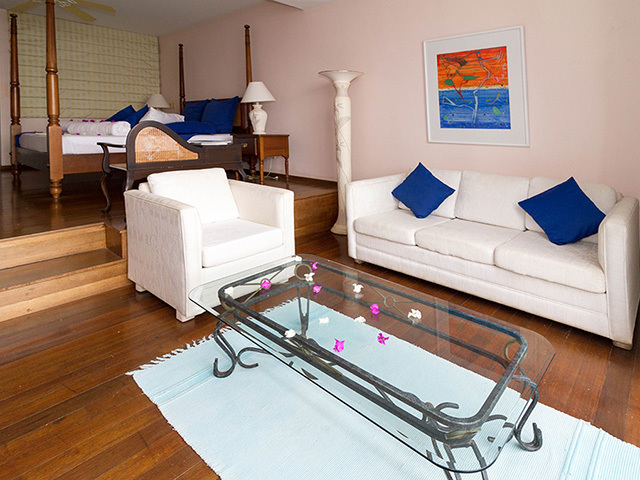 Elegant rooms overlook the sea and are so awash in the sunlight they positively glow. The view from every room is a study in blue. Of course I'm excited, I'm coming back to Paradise Island, Tobago, and my all-time favourite hotel, the magical Blue Haven at beautiful Bacolet Bay.This will be my tenth visit in nine years Every time I feel it can't get any better... and then it always does. My husband and I were extremely pleased with Blue Haven -- the service, cleanliness, and all-around welcoming atmosphere was confirmed on a daily basis. Each of the people who made our stay memorable, from the front desk to the restaurant servers to the housekeeping workers and the owner, were genuninely friendly and caring. From the moment we entered the reception area and saw the amazing views, we knew this would be a fabulous stay. I was impressed by the modern touches to an essentially colonial style building. But it was truly the warmth of the staff that made us feel sooo welcomed. Royals and film stars have been drawn to the historic Blue Haven Hotel since the 1940's. It is said to be the site where Robinson Crusoe was stranded in 1659, according to Defoe's celebrated novel. Extensively renovated, this glamourous and romantic property combines the tradition of the old days with the best of modern facilities.